I believe in three things only, disco, chocolate, and true love, and they're all the same thing, really. My only role and goal when it comes to the world is to observe. Capitalism and socialism might have been, once upon a time, in a mythical fairy tale of empires past, opposites - thesis and antithesis. I say "might" because I think even that is a tale told by wise old fools to keep children afraid of the dark. ...what results when political economies are run by and for tiny elites. yesterday's extremes have both failed. Cutthroat competition in every aspect of life soon becomes abuse. Enforced cooperation soon becomes unendurable. So what now? Well, surely not choosing sides in this textbook false dichotomy - which unfortunately is what many still hope to do - but transcending it. Today capitalism and socialism are not opposites. They are complements. capitalism and socialism working together, each strengthening the others' weakness, a kind of yin and yang of human organization. We see this already at work in the world's most successful societies, like Scandinavia or Canada. In what specific way? Well, let's examine reality for a moment. Capitalism is very, very good at providing people things like iPhones and craptastic summer blockbusters and dating apps and edible deodorant and designer diapers and reality TV. You might call them idle pleasures. Which I might not like, but the average person certainly does. And that's fine. If they have the basics of a genuinely good life first. The American right and left love to pretend as if there's some kind of great debate, mystery, about it. There's not. food, shelter, income, safety, security, opportunity. transportation, healthcare, education, environment, relationships, etc. If you think about it, no matter how much money you have, you can't really buy such things unless a society has invested in them first. These "things" are what I call "fundamental goods". They are what makes a life good at its root. Through them, everyone can be happy, and grow into their potential - without them, no one can be, no matter what your latest self-help bestseller says. Without a few meals a day, a little bit of money in the bank, and your health, no amount of positive thinking can get you to happiness - nor should it. Human beings are not all born to be monks - they are born to dare, risk, defy, rebel, imagine, create. And to do all that, they need the basics. Without the basics, democracy can't survive, society can't cohere, people can't flourish, and lives can't be fully lived. So. The two great systems of the past, learning to work together. Where do we see it happening? As I said, all over core Europe and Canada of course. There, capitalism and socialism are being mixed together in sophisticated and bold ways. socialism provides the basics, and capitalism offers endless idle pleasures which only really count if you have the basics. Where don't we see it happening? Well, ironically, or maybe logically, in the two fallen empires of the past. America still clings to extreme capitalism, which has devolved into oligarchy - just as it has in Russia. Here, people have idle pleasures but not the basics - and for the simple reason that you can't eat your iPhone, or educate your kids with Uber's nonexistent benefits package, middle classes are choosing demagogues to topple the elites who have failed to provide working social contracts. Choose your apocalypse. These are the stakes of this troubled age. If humanity is to survive, it's going to have to grow. Up... It is going to have to mature beyond the simple, crude polarity of yesterday, and learn to synthesize its great lesson. Capitalism and socialism aren't adversaries, opposites. They never really were - more yin and yang. Every thesis and antithesis yield ultimately only a new synthesis. The opposite of capitalism and socialism is oligarchy. And the new synthesis beyond oligarchy is social capitalism, or capital socialism. 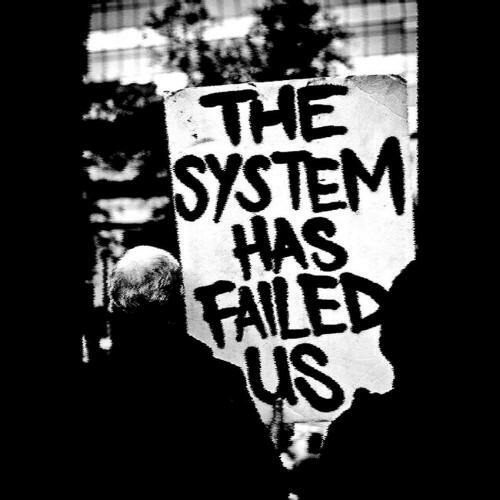 Whatever we call it, it is a system in which people are freer. Yes, really. "you've got to compete like an animal for your life every single day of your life, or else die young." cooperate for your life, or else. But the point of synthesizing human organization beyond capitalism is that human beings no longer have to submit to those foolish non-choices, demands, little tyrannies. For whenever we base a whole society upon one principle, value, or goal - whether it is brutal, heartless competition or cooperation - no matter how noble it may seem, that is what we have created - a kind of totalism, a little tyranny. It cannot end up a free, thriving, and healthy place. Human life is richer than that. And so to develop truly wealthy societies, we are learning today, that there is no one true way - or, if you like, that the one true way is that there are many things human lives need before abstract noble ideals, which count for nothing if one's life is falling apart. Instead of puritanical ideals, there are many fundamental goods that societies must put first. Then democracy endures, freedom expands, and society itself matures.